I now realize that it’s been almost four months since I last posted. Apparently I have been doing more drinking that writing. Well, since I’d rather avoid doing less drinking, I better do more writing. There’s been one cocktail that I’ve been meaning to get to since I started this blog, but I kept putting it off because I felt I needed to do it justice. In Esquire Drinks, David Wondrich describes it as one of the four pillars of (cocktail) wisdom and says “When properly built, the Manhattan is the only cocktail that can slug it out toe-to-toe with the martini.” He’s spot on, except that there’s no contest between a Manhattan and a martini–there’s just not. 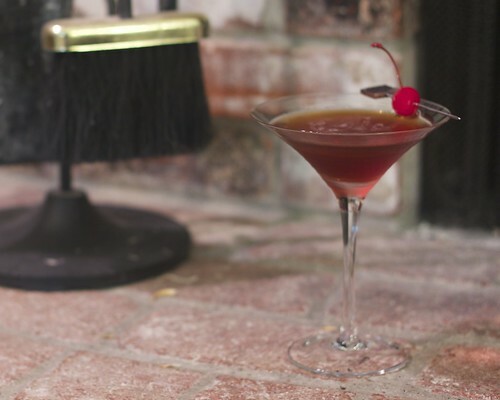 In looking into the history of the Manhattan, I ran across an interesting article in the San Francisco Chronicle by bartending legend, Gary Regan, who claim “it’s the Manhattan that’s the true sovereign of the V-shaped glass.” There you have it. Seriously, he makes a very good point that, unlike the martini, which switched vermouth, lost the bitters and has basically devolved into strained gin or (abominably) vodka, the Manhattan hasn’t changed significantly since it first appeared in the 1860’s. As far as it’s murky history goes, Regan cites a story in Valentine’s Manual of New York (ca. 1923) that attributes it to an unknown bartender named Black in an unnamed bar a few doors below Houston on Broadway, substantially earlier than the story ascribing it to the Manhattan Club in the mid-1870’s. As far as how make a “properly built” Manhattan, I think we have to go with Wondrich here. It has to be rye. Regan also likes it made with bourbon and a load o’ bitters, but I’ve played with it and it just doesn’t have that magic that the rye brings. The bourbon is just too sweet and too smooth. That edginess of rye, paired with the vermouth and bitters is what makes this the greatest cocktail ever. I am so convinced of this that when I go out, if they don’t have rye, I’ll get a Rob Roy instead. Add ingredients to a Boston shaker. Add ice and stir (at least 15 seconds). Strain into a chilled cocktail glass and garnish with a cherry. Okay, two confessions. I actually (slightly) prefer the cocktail with 2 1/2 oz of rye. I have played around with a range of ratios between the whiskey and the vermouth and if you go to 3:1 that harmony that makes this cocktail work is lost. It just becomes whiskey that is sweetened up a bit. Also, the bitters are absolutely required, though I will be trying one with a bottle of Boker’s bitters that I got as a birthday gift last month. Finally, as much as I like playing with the cherry while drinking a Manhattan and eating it’s boozed soaked remains when I’m done, I actually think I like it just hair better with a twist of lemon, but it’s a deviance which I indulge only in the privacy of my home and in the absence of company. As I said at the top of this post, I contend the Manhattan is the greatest cocktail ever concocted. It embodies that amazing alchemy of the truly great cocktail–it’s simple with only three ingredients, but they harmonize so amazingly that the result is much more than the sum of the three ingredients. It is a phenomenally delicious cocktail. I am fond of the cherry at the end, I must admit.